Mary Jo Beamish is a 1985 graduate of Central City Business Institute, where she earned an Associate’s Degree as a legal secretary. She has been with the Firm since 1989, where she oversees the day to day functions. Among other duties, Ms. Beamish gets preliminary information from potential clients which is used in scheduling an initial appointment; oversees the collection of medical records, when needed; coordinates with the mediator and parties seeking a separation agreement; and handles all scheduling and billing matters. 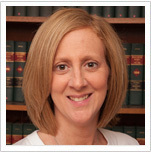 Overwhelmingly, Ms. Beamish is the first contact new clients have with the Satter Law Firm. Her ability to interact with people in a competent and compassionate manner, while juggling multiple tasks, makes her invaluable to the Firm. Particularly if you have a problem with scheduling or billing, we ask that you start with Ms. Beamish. When not working, Ms. Beamish is an avid soccer mom, traveling all over the northeast to watch her daughters play.